Fourth- through eighth-grade girls tackle the LEGO MindStorm activity at the Girl Powered STEM Workshop on Saturday in the Grand Canyon University Engineering Building. Forget stirring gooey cookie batter. Instead, fourth- through eighth-grade girls at Saturday’s Girl Powered STEM Workshop in Grand Canyon University’s Engineering Building stirred up a little chemistry, churning out a few batches of wonderfully flubbery, slime-like gooey gak. Then — mind storm! — they programmed LEGO cars. Their minds also were blown hearing about missile launches, the unfettered engineering joy of blowing up stuff, and the next generation of tank munitions called AMPs, or Advanced Multi-Purpose tank rounds. The girls at the workshop — presented by the GCU Robotics Club and Strategic Educational Alliances and inspired by VEX Robotics’ Girl Powered initiative — bathed in the battery light-powered glow of science, technology, engineering and math at various learning stations as they were encouraged to pursue STEM careers. Women make up just 24 percent of the STEM workforce, according to VEX. Ashley Lochetto (right) speaks about her job as a test engineer for the Army at Yuma Proving Ground. Other speakers at the event were Amy Peters (left), Senior Director of Mission Assurance Engineering at Northrop Grumman, and Michelle Ryan (center), a senior test engineer for Intel. Participants also soaked up the experiences of impressively confident women engineers, such as Ashley Lochetto. Lochetto, a direct-fire test engineer for the Army at Yuma Proving Ground and one of three speakers at the event, knows how it feels to be the only woman engineer walking into a room of male engineers. “I said, ‘Hey! I’m going to blow stuff up today!’” said the high-energy Lochetto when she walked into one of those situations. That seemed to break the ice. Lochetto went against the grain of her medical field family to study mechanical engineering with a specialty in explosives engineering at the New Mexico Institute of Mining and Technology. “Those Bradleys (Army tanks dubbed Bradley Fighting Vehicles), I shoot those,” she told the girls. Unlike Lochetto, who said she wrote her college essay in second grade about how she wanted to become an engineer, Ryan aimed for teaching. Then her uncle, a civil engineer, told her about an engineering program for girls at the University of Arizona. With encouragement from her family, she decided to change her career path. “I didn’t even know what a breadboard was when I was in my engineering class,” she said. Amy Peters, Senior Director of Mission Assurance Engineering for Northrop Grumman Innovation Systems, told the audience of math- and science-minded girls about her job — launching rockets. The coolest part of her job, she said, is the drama of sitting at the launch console before shooting off those big rockets. She also told the girls about one of the coolest awards she received, a Champion of the Year Award in 2017 from the Missile Defense Advocacy Alliance, a nonprofit organization whose mission is to drive for the deployment, development and evolution of missile defense. The organization was founded in 2002 by Ricki Ellison, a former professional football player with the San Francisco 49ers and Oakland Raiders. The girls in the audience erupted into applause after Peters’ story and the image of her dramatic catch. She also has received a challenge coin, given by generals who “think you’ve done something great,” Peters said. Lochetto, a challenge coin recipient, too, said some of her biggest awards, ironically, have been her failures. “I had a rocket that blew up. My cores were spinning out, like this,” she said, her arms motioning in horizontal circles. She explained how a TOW anti-tank missile operates with the help of a little eye called a ruby. As it turns out, the ruby was cracked. “Even the little failures teach me something,” she said, then told the girls about a project she’s excited about: “My favorite test will be the next generation tank round, the AMP,” then spoke about smart rounds and how operators actually can speak to weaponry and tell it what to do. Students at the Girl Powered STEM Workshop made battery motors and primed their chemistry skills by making gooey gak. Girls in the workshop learned even more at various activity stations following the talk — just call it speed dating, except that the date is with science. At the gooey gak station, participants stirred borax, water and glue and, voila! The flubbery, gooey gak slime mixture emerged. One group of girls headed to the LEGO MindStorm station, where the goal was to program LEGO robots to zip from a taped starting line on a table to a taped-off finish area at the other end. Out came the measuring tape, and it was back to the computer for more programming. Another group headed to the Battery Motor station, where they made simple electric motors using a battery, wire, paper clips, modeling clay and a small magnet. The activity showed how electrical energy can be converted into mechanical energy via an electric motor like the battery motor, which works by way of the interaction between a current and magnetic field. Participants also stopped by the goal-setting station, where they talked about the goals someone might have in robotics. They also discussed their dreams. Sixth-grader Isabel Cardenas of Rogers Ranch Elementary School has her sights set on becoming a mechanical engineer: “I just really like working with coding and with building,” though she said the idea of working at NASA also piqued her interest. 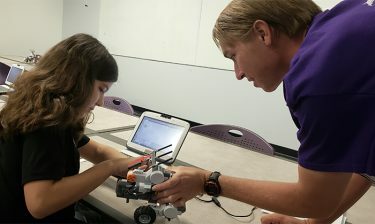 Ed Koeneman, GCU electrical engineering technology professor and the Robotics Club faculty adviser, said the Girl Powered workshop came about after the club heard about the opportunity to get sponsorship from VEX. That’s when he got together with Cori Araza, Director of STEM Outreach and Program Development, to partner and organize the event. VEX Robotics’ Girl Powered initiative aims to redefine the face of STEM and show how everyone is welcome in the robotics community. 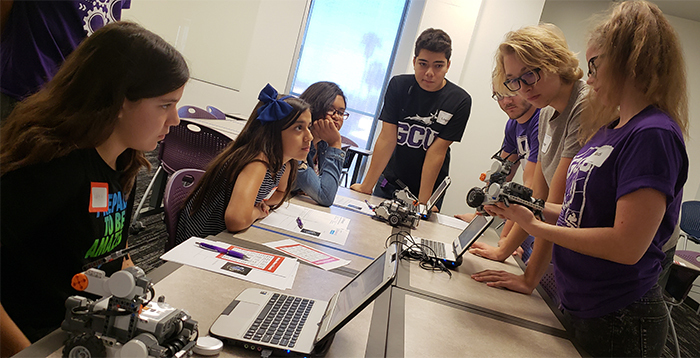 GCU’s Robotics Club heard about VEX Robotics’ Girl Powered initiative and wanted to do something on campus to encourage girls in their science, technology, engineering and math interests. According to VEX, “Walking around any competitive robotics event, or into the office of countless high-tech companies, it’s not hard to see that the majority of the participants or employees are men. Girls make up only 23 percent of VEX participants, and women represent 24 percent of the STEM workforce. Ryan said it’s important to have more women in the field because women just make teams work differently. “Women bring a whole new dynamic,” she said. “We grow up differently. We have different views. You build a different product that way,” she said. 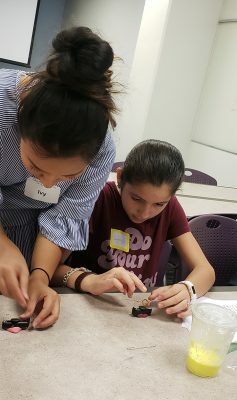 GCU computer science junior Astrid Guaran is just one of a number of young women who are members of the University’s Robotics Club. She said the Girl Powered workshop help set the stage for the next generation of robotics engineers, mechanical engineers, computer programmers and the like. Contact Lana Sweeten-Shults at lana.sweeten-shults@gcu.edu or at 602-639-7901.